ARTIFACT: This is a late 1940s or early 1950s pin for the Douglas Aircraft Company, which manufactured aircraft in California from 1921 until 1967, when it became McDonnell Douglas. The pin was awarded for ten years of service with the company, and was made by Robbins of Attleboro, Massachusetts. The globe at the center of the company's "Around the World" logo is very convex. VINTAGE: Circa late 1940s or early 1950s. SIZE: Approximately 11/16� in diameter. CONSTRUCTION/MATERIALS: Gold-filled with green enameled details. 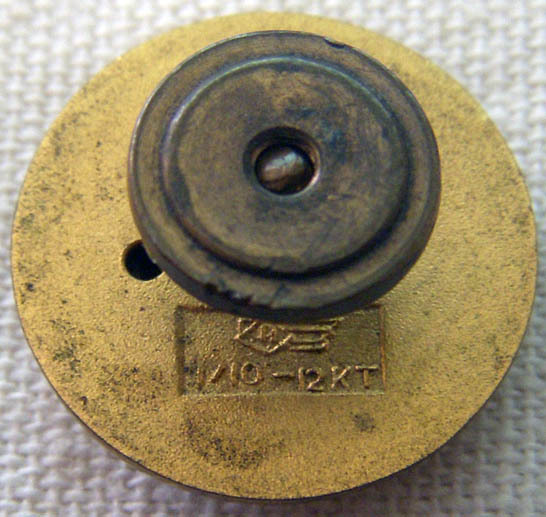 MARKINGS: 1/10 � 12KT and Robbins maker mark.